This post is sponsored by Mountain Rose Herbs. Things I crave every day: swimming in salt water, a long stretch, cardamom coconut ice cream, meditation and crispy-spicy sweet potato fries. If I can get all of that in one day, I’m flying high. Which brings me to me next point: I’ve never posted my recipes for cardamom ice cream OR sweet potato fries! This is madness. SHEER MADNESS. I’ll get to that cardamom ice cream eventually (I swear). 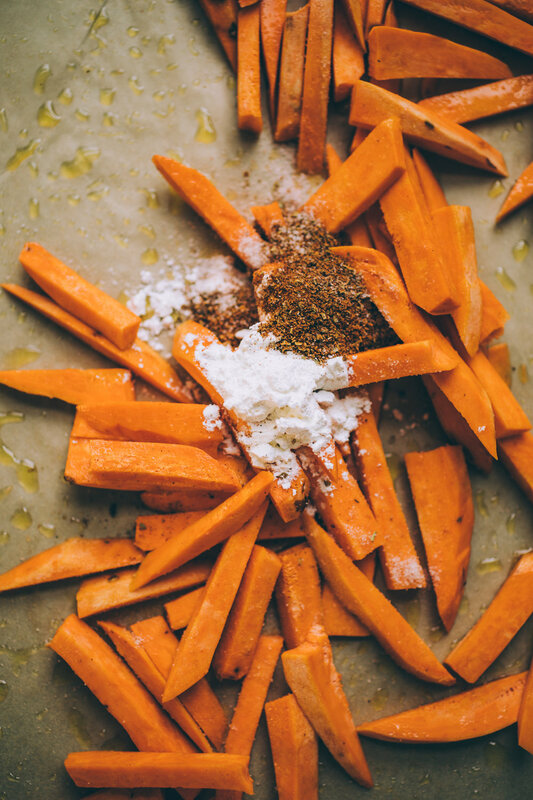 But for now let’s get to talking about my recipe for sweet potato fries! In my opinion, sweet ‘tato fries should be easy to prep -- a no-stress kind of snack or side. The trick to getting sweet potato fries crispy is to douse them in cornstarch, arrange the fries in a single layer on the baking sheet (no overlapping for heck’s sake) and then bake at least partly on the bottom rack of your oven. I’m currently obsessed with the mesquite seasoning from Mountain Rose Herbs which is so frackin delicious on sweet potato fries. Herby, smokey, pungent, tangy. It’s like magic savory spice dust. I’m a huge fan of all of their spice blends, which are not only creative and delicious but they’re also all really fresh. Like, just came out of a spice grinder fresh. I’m usually not a big fan of spice blends because I like to have control over all of the spice proportions in a mix, but I’ve gotta say whoever does the blend ratios at Mountain Rose definitely found their niche in life. As y'all could probably guess I’m very serious about my spices. I have a huge 3'x2' drawer and two shelves of my pantry dedicated just to spices and culinary herbs. I always buy small amounts of herbs and spices just to ensure that my ingredients are as fresh as possible. I love that I can get small quantities of herbs, spices, culinary oils, salts and the like on the Mountain Rose site for an affordable price. A 2oz bottle of mesquite seasoning, for example, is $4.90. But that quantity lasts me a month. And when I need to buy, say, flaky sea salt in bulk the price breakdown is on point. Aside from the fries I’ve also got a cashew-based chipotle aioli recipe for you all today. Yes, aioli. AKA fancy mayo. It’s creamy, spicy, tangy and extremely dip-able. I went with a southwest kind of theme, featuring lime, smoked paprika, regular paprika, chipotle and smoked sea salt. The aioli is also great as a luxe sandwich spread. And no doubt it’d be great smothered over steamed veggies and rice. I brought the fries and aioli to a potluck recently and it was a huge hit — no one could believe the aioli was vegan! I always take that as a good sign. And to finish out the Summer in style, here's a GIVEAWAY for a southwestern seasoning kit from Mountain Rose Herbs! Includes: mesquite seasoning, smoked sea salt, smoked paprika, regular paprika, chipotle powder, mesquite powder, extra virgin olive oil, regular sea salt and onion powder (all Organic). To enter, follow me on instagram and leave a comment below with your username. Enter via this post on instagram as well for a double entry. Giveaway ends 8/30/2018 at Midnight EST. Notes: 1. The trick to getting crisp fries is coating them in cornstarch to absorb moisture, then baking on the bottom rack for extra crispness. 2. If you can’t get your hands on mesquite seasoning, you can do a 1 tsp each smoked paprika, paprika, chipotle chili powder, mesquite powder, onion powder and ground mustard seed, and throw in a minced garlic clove too for some extra oomph. Preheat oven to 425F. Line two baking sheets with parchment paper. Add your pile of sliced and peeled sweet potatoes out on a parchment lined baking sheet and toss with 2 tbsp olive oil until coated. Add cornstarch, mesquite seasoning, salt and toss together until evenly coated. Arrange the fries out on the two baking sheet so that they’re not touching. Place one baking sheet on the bottom rack and one on the middle rack and bake for 18-20 minutes, switching the tray positions half way thru (put the bottom tray on the middle rack and vise versa). Fries are done when crisp and just blackening a bit. Notes: The longer you soak the cashews the easier they’ll be to blend. And a shorter soak time means your final aioli may end up looking slightly grainy (this never bothers me much). Add all of the aioli ingredients to the bowl of a standing blender: soaked cashews, olive oil, garlic clove, lime juice, smoked salt, water, paprika, chipotle and smoked paprika. Blend on high until smooth and creamy, scraping down the sides of the blender as necessary to get everything incorporated. Serve immediately, or store covered in the fridge until ready to use. This post is sponsored by Mountain Rose Herbs. All writing, opinions and content are my own. Thank you for supporting the brands that support this site.